Pizza ready to bake. 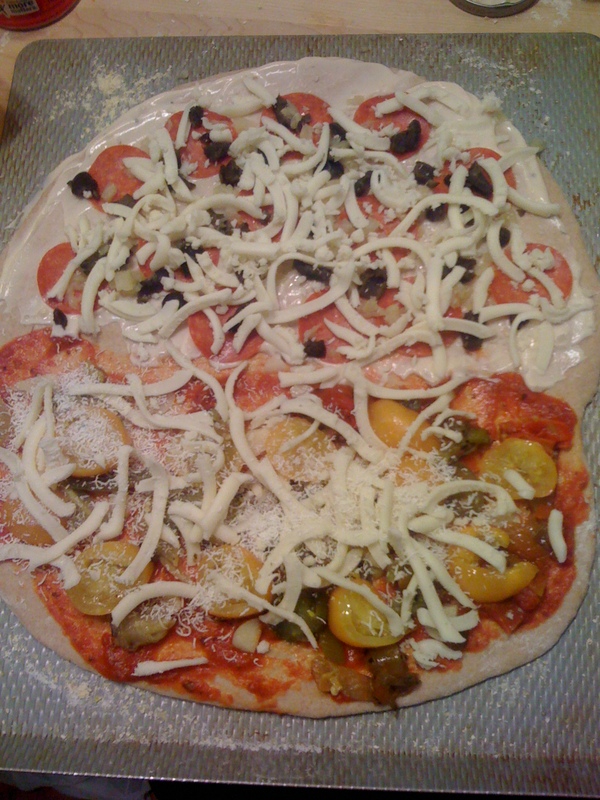 The more local half is garlic, tomato, jalapeno, roasted sweet pepper and two kinds of cheese. I’ve been looking for a new food challenge. My previous one – eating from the garden every month – pushed my gardening, freezing, canning, drying cold-cellaring and my thinking. My new challenge: by Sept 2013, make a pizza with local ingredients. Bonus, make the pizza with commercial local ingredients. Why pizza? Its popular. It is mainstream. Its flexible with the seasons. Aiming for using commercial ingredients will demonstrate that our food system is well enough developed to be able provide local pizza ingredients to anyone. It also opens the door for a local pizzeria to make local pizza. Defining local will be fun — and will perhaps provide some insights. As a first cut, I’ll just track the distance the product travels on the last leg of its journey. But ultimately, the ingredient needs to be local from its origin through any manufacturing. And what is “local?” The real issue I think is more than “food miles” but I’m not sure how to put a handle on it yet. This entry was posted on September 16, 2012 at 9:49 pm and is filed under Uncategorized. You can follow any responses to this entry through the RSS 2.0 feed. You can leave a response, or trackback from your own site.